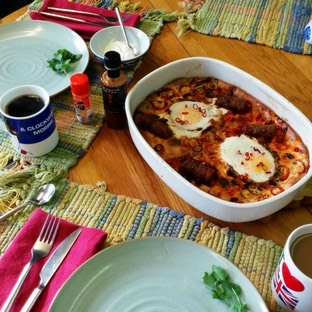 For this weekend’s brunch themed Capsicana Twitter cook-off, I made a super-spicy version of the classic “Toad in the Hole.” Instead of normal sausages I used Spicy Bath Pig Chorizo, and with loads of chillies including three dried bhut jolokia, this dish was far from bland. Surprisingly this dish won the cook off, and I say that because there were so many outstanding entries. Take a look at them by searching for the hashtag #CapsicanaCookoff. Already looking forward to the next cook-off. They are a ton of fun, you should enter! I used the batter recipe from Pamela Gwyther’s “Best of British Cooking” and then assembled a cast of terribles to mix in. The result was pretty darn fiery but not intolerable - I think the stodgy batter resisted the pepper onslaught quite well.